AMD lost sales to the GPU giant last year. NVIDIA's flagship graphics card, the Titan X. Source: NVIDIA. 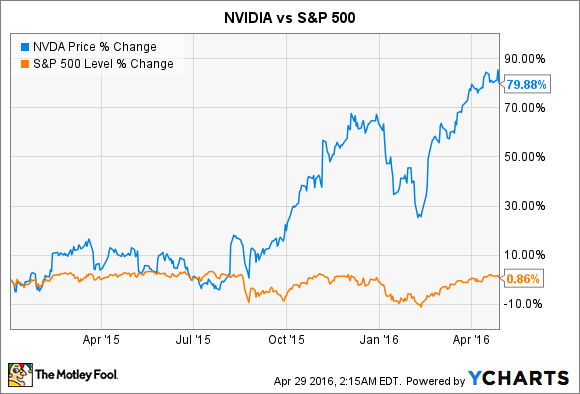 Shares of NVIDIA (NASDAQ:NVDA) soared in 2015, rising more than 63%. The maker of graphics processing units (GPUs) strongly outperformed the broader S&P 500 last year, and that outperformance has only intensified in recent months. A series of strong earnings reports have fueled NVIDIA's gains. Meanwhile, optimism surrounding the company's prospective involvement in virtual reality and autonomous vehicles has helped boost the stock's multiple. But fundamentally, the last year has been a tale of conquest: NVIDIA has absolutely dominated the market for discrete graphics cards, taking significant market share from its chief rival AMD (NASDAQ:AMD). NVIDIA and AMD have a virtual duopoly on the market for dedicated GPUs. They can both benefit from rising demand, but one's market share gains are the other's misfortune. 2015 was a clear case of NVIDIA taking share from AMD. NVIDIA has provided the majority of the world's dedicated graphics cards for several years, but its dominance over AMD rose to an unprecedented level last year. In the first quarter of 2014, NVIDIA supplied about two-thirds of the world's graphics cards, with AMD providing the remaining one-third. In the second quarter, NVIDIA's share slipped somewhat, falling to 62% as AMD's rose to 37.9%. But since then, NVIDIA has seen its market share increase in almost every quarter, while AMD's has declined. In the fourth quarter of 2015, NVIDIA captured 78.8% of the market for dedicated graphics cards -- AMD's share was down to just 21.1%, according to Jon Peddie Research. Overall demand for discrete graphics cards rose in 2015, jumping to 50 million from 44 million in 2014. Much of this gain was driven by demand for higher-end graphics cards. Sales of enthusiast-level cards roughly doubled, from 2.9 million in 2014 to 5.9 million in 2015. In recent months, NVIDIA has undertaken several key initiatives, working to build up its automotive and data center businesses. Still, graphics cards continue to generate the overwhelming majority of NVIDIA's sales -- more than 84% of NVIDIA's fourth quarter revenue was GPU-related. Graphics professionals purchase NVIDIA's cards, but much of its demand comes from PC gamers: gaming accounted for nearly 58% of NVIDIA's sales last quarter. Cutting-edge PC games require powerful graphics cards to function, and in 2015 gamers overwhelmingly chose NVIDIA. Much of NVIDIA's 2015 product lineup was simply more attractive. AMD's 2015 flagship card, the AMD Radeon R9 Fury X, was outperformed by NVIDIA's similarly priced GTX 980 Ti, for example. "On average [NVIDIA's GTX 980 Ti] performs better [than AMD's Radeon R9 Fury X] at every resolution, it has more VRAM, [and] it consumes a bit less power..." AnandTech's Ryan Smith wrote in his review. At the same time, NVIDIA has steadily built up an ecosystem of exclusive services around its hardware that make its cards more attractive to PC gamers. Owners of NVIDIA's graphics cards can take advantage of specialized G-Sync gaming monitors. They can stream their games over their home network or the Internet to one of NVIDIA's SHIELD devices, and record and stream their gameplay experiences with NVIDIA ShadowPlay. AMD offers alternatives of its own in some of these instances (FreeSync as an alternative to G-Sync, for example), but its offerings are not as significant or robust. With such commanding market share, it's not clear how much more of the market NVIDIA can take. But if it continues to deliver exceptional graphics cards and compelling services, NVIDIA should be able to maintain its dominance over AMD for the foreseeable future.